Weidmüller PROtop power supply: the innovative high-end power supply with DCL technology. – Futureproof: the communicative and high-efficiency PROtop power supply for the highest of demands. – PROtop is the best in its class. 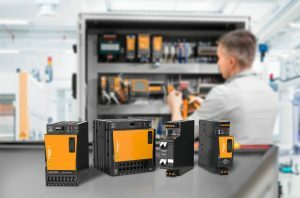 St. Jacobs/Waterloo, ON, December 15, 2017 – Manufacturers Automation announced that Weidmüller has introduced their new power supplies in the high-end range with PROtop: a power supply for the most demanding of applications – powerful, efficient, innovative. Thanks to the latest DCL technology (DCL = dynamic current limiting), PROtop provides a very good dynamic range for the reliable triggering of circuit breakers and powerful motor starts. High efficiency and a long service life saves energy and cost. A significant increase in system availability is achieved via the creation of redundancies (n+1 redundancy), a parallel connection of power supplies with diodes or redundancy module. The integrated O-ring MOSFET technology from PROtop enables the direct parallel switching of power supplies, by the simultaneous reduction of power loss. Traditional diodes or redundancy modules no longer need to be incorporated. The plug-on module transforms PROtop into a communication-capable power supply. This creates new opportunities to make system operation faster, more flexible and more efficient. In short, PROtop is future-proof. The potential of Industry 4.0 is hence fully exploited. 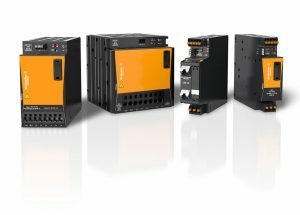 High-end power supplies must ensure reliable, sustained and efficient supply to electrical equipment, even in harsher industrial environments. The systems also need to have constantly available power reserves, long service life and insensitivity to surge voltage, ambient temperatures or vibrations. PROtop is predestined for this purpose, with its innovative features, such as peak current reserve or attachable communication module. PROtop is equipped with new-type DCL technology. This future-oriented technology provides considerable pulse energy reserves throughout. The resulting dynamic range is used for the reliable tripping of circuit breakers or powerful motor starts. Therefore, heavy loads can be operated more effectively. For example, up to 300% of the starting torque of an engine is available for approx. 100 ms or 150% for 5 s. Static power reserves of permanently 130% are available up to ambient temperatures of 40° C.
PROtop power supplies benefit from a very compact design. The space-saving design allows additional assemblies to be accommodated, thus increasing the functional density in the control cabinet. Control cabinets and in fact the whole machine or system can subsequently be more compactly designed. PROtop is even more convincing considering its efficiency of up to 95.4%. It reduces heat loss and energy costs. The high MTBF time (Mean Time Between Failures) of > 1,000,000 hours as stipulated by the IEC 1709 (SN29500) standard, in addition to a long service life of > 20 years, guarantees a high level of return on investment over the entire operating life. PROTop always makes an impression with such convincing performance across the range. In fact, the products serve as a benchmark for higher quality and reliability. PROtop significantly increases system availability and lowers costs. Communication-capable components form the basis of sophisticated networked production. This is the only way to fully exploit the potential of Industry 4.0. Product and status-oriented data, as well as measured values internal to machinery and energy parameters are recorded and made available in a cloud. And this is where data evaluation takes place. In turn, the evaluation results are made available to all relevant network participants This enables system operators to set up new services to optimize and diagnose their production processes or for energy management. In order to prepare manufacturing companies for the Internet of Things (IoT) and data-based production control, we strive towards the rapid integration of all devices and simple transfer to the cloud. In this way, PROtop already set its sights on the power supply requirements of tomorrow. A retrofit communication module is simply plugged into the PROtop power supply, whereby the user is confronted by an interface for transferring process data to higher-level control, thus laying the basis for process optimization via condition monitoring and remote control facility. Condition monitoring and remote control are prerequisites for ensuring that all machine or system automation components are in continual and reliable supply. Maintenance interventions can be planned and effectively minimized, therefore the profitability of the system is increased. This benefits operators across a range of industries, from food and packaging plants with stringent requirements for hygiene, protection classes and corrosion resistance to hard-to-reach installations on offshore wind farms. With its impressive characteristics, PROtop is the first choice wherever reliability, longevity of service and energy-efficiency are indispensable as well as for use in harsh environmental conditions. PROtop power supplies are the new benchmark in the high-end range.